Model T Ford Forum: Any solutions to reducing the residual exhaust smell? Any solutions to reducing the residual exhaust smell? Model T Ford Forum: Forum 2018: Any solutions to reducing the residual exhaust smell? My passengers (including the girlfriend) often comment on how they smell like exhaust fumes after going for a ride. Is there any way to reduce or eliminate this? This happens to me when the mixture screw is slightly rich. Doesn't happen when ever so slightly lean. Check the exhaust manifold to tail pipe connection to see if it is sealed properly. Also check your spark plug color at the electrodes to see if you are running rich. Take a shower, shampoo, and change clothes! "It smells good in here Grampa" is what my grandson said upon entering the garage one day. Perhaps attitude and conditioning is required for full enjoyment. 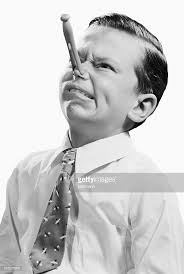 Dale..'bout choked on your post!! I half agree! But, I was gonna say, tell 'em to wash their clothes and take a shower when they're done riding. Or save time and do both at the same time in the shower! Ha ha. Are you sure it is exhaust, and not oil fumes? Try a different brand of oil and see if it changes or goes away. I’ve been using Wal-mart oil for years because it is low-odor in the T.
If the rings are worn and there is even a little blow-by, then a lot of oil vapor can come out the oil breather cap and valve cover and fill the passenger area, especially on an enclosed car. Additional equipment can be provided for your riders. How about a shot of Marvel Mystery Oil? This must be why it has that nice wintergreen smell. Your passengers will marvel at the difference. Dirt, grease and oil on the engine can cause smells when the engine is hot. Cleaning everything in the engine compartment can eliminate that problem. I've never noticed any exhaust smells with our roadster or touring. I have a touring car. I sealed the holes in the floor boards by adding the boots that snap around the pedals and brake handle, which are available from the parts suppliers. I made some fitted wood at the back of the head that closed off a huge leak there. The rubber floor mat also helps. I take care to tighten the exhaust pipe nut and make sure there are no exhaust leaks where the exhaust manifold bolts to the block. I stop any gas leaks by using EZ Turn fuel petcock grease and keep the fuel line fittings tight. I have a new float valve in the carb. The back seat has a floor mat too which I think helps. No one has complained about exhaust smell even when running with an open cutout which is under the front floor boards. Basically just stop any leaks including into the car through the floor boards. Drive FASTER! Blows the odors away quicker. 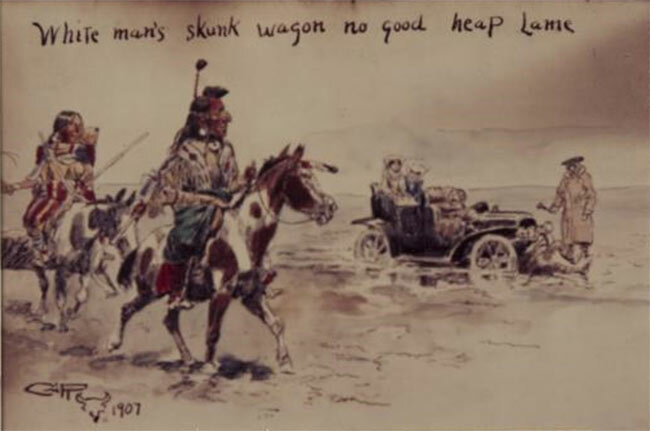 I'm reminded that when early automobiles arrived out here in the golden west, the Indians called them "skunk wagons". 'Nuff said. As Rich noted, some conditioning and positive experience may be a pre-requisite to enjoying the Model T experience. Smells good to me, too !! This 1907 Charles Russell painting was used as the logo for a Montana MTFCA Tour some years ago. Is that a dead goat under the front of the car or is the man with the wrench trying to finish it off.